Homebuyers are returning to the neighborhoods of Betton in Tallahassee, which is no small wonder as this has always been a highly prized location in Northeast Tallahassee. There were nine home sales in the Betton neighborhoods in the month of July, a record number that is unsurpassed going back 12 years. The Betton neighborhoods include Betton Brook, Betton Estates, Betton Hill, Betton Hills, Betton Oaks, Betton Place, and Betton Woods. For the most part, you can always find homes for sale in Betton Hills and Betton Hills, as well as the higher priced Betton Woods. The other Betton neighborhoods are small enough that it is common to have no inventory available. Our updated report on the Betton neighborhoods shows all the recent home sales that have consumed the majority of the distressed homes and have returned this prominent area of Tallahassee to a vibrant real estate market. Distressed home sales in the Betton neighborhoods are nearly non-existent, which is VERY rare for any neighborhood in the Tallahassee real estate market. 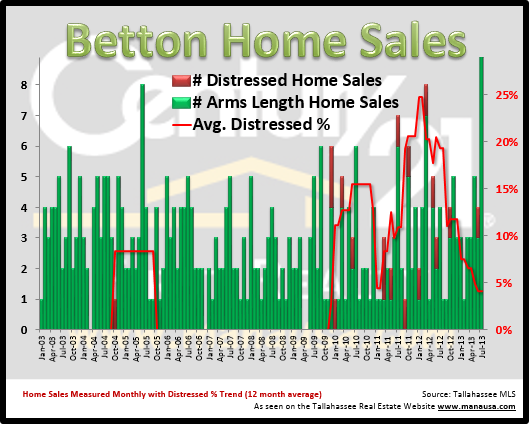 In the real estate graph above, the number of home sales each month is measured on the left vertical axis, while the ratio of distressed home sales to all Betton home sales is shown on the right vertical axis. Arms length home sales are shown in green, while the distressed sales (foreclosures, short sales, bank owned properties) are shown in red. I find it very promising that July recorded a 12+ year record, but the most impressive aspect of this achievement is that all sales were arms-length, meaning it was a "clearance sale" based record. Home values in the Betton neighborhoods are now similar to what we saw in April of 2005. That's right, you can buy a home in a Betton neighborhood with near-record low interest rates at the same price you would have paid in 2005! Based on the home value trend in the graph above, I don't think people sitting on the fence waiting to buy in Betton are going to benefit from waiting any longer. If you would like help negotiating the best deal possible for a house for sale in Betton, just drop me a note and we can schedule a time to review supply and demand and ensure you know exactly what to offer. 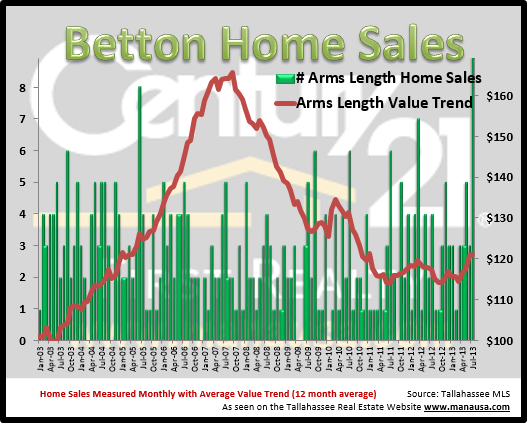 I hope this report has helped you better understand home values in Betton, please check back again for future updates to this and other Tallahassee neighborhoods.